If you want to report a found item, please email and I'll update this page to list the item. If someone claims the item from you, please contact to take down the listing. Youth black Under Armour catcher's mitt. Found at Veterans Field in mid-June. If yours, contact for information on how to retrieve. 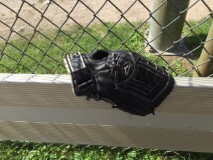 Two Easton black and blue baseball bags found at Veterans Field parking lot July 21. If yours, contact for information on how to retrieve. If you lost something at an ABYB event or on one of the ABYB fields, it might be turned in. If so, let us know so we can match it up with the owner! Contact to list an item, and of course contact your coach who might have cleaned up after the event and taken the item for safe keeping.